Jenny Pong Seow Chin was born in the para-urban area around Ipoh, Malaysia. She grew up having to support her siblings in a poor farming home and taking on heavy household responsibilities, thus causing her to drop out of school at age 12. She had odd jobs throughout her teenage years so that she could earn money to pay for household expenses. When she was 18 years old, she married the love of her life and within that year had gotten pregnant. She was so excited to have her baby until tragedy struck. She was given an operation to remove stillborn baby. However, a few days later, she started feeling weak because of a post-natal viral infection and she lost sensation in most of her body. Her parents brought her to the ICU where she fell into a coma for two years. When she woke-up, she did not have any feeling in her arms and legs. Her husband abandoned her, moved out of their house and out of her life. Her family especially her mother encouraged her to keep trying with physical therapy till she regained sensations in her arms. She never managed to get the sensations back to her legs. Not too long after, the doctor amputated her legs when she had serious gangrene infection. After the surgery, she did not have any way of getting around except dragging herself on the floor to do her household duties. One day, her then eleven year old brother constructed a trolley for her to get around without injuring herself. As years went by without proper physiotherapy and special wheelchair, gravity took its toll by affecting almost every internal organ in her body. She was told that she would not be able to sit up again. And so she lies on the tummy on a home-made wooden trolley for 26 years. Here is how her daily life unfolds. Last few years were quite hard on her. She had heart attacks due to the unusual posture for so long. She was diagnosed with leukemia, her kidney had shrunk and the urinary tube infection has been all too often. Her beloved mother passed away with cancer in 2011, so did her brother in law two months later. She has learned that life does not always go as planned, often, things can go very bad in life, ’just take it and smile’, she reminds us. It does not matter what has happened to you as long as you can be here to live another day. People are going to say something about you no matter what you do –good or bad, but it is how you feel about yourself that matters. And what you do with your life. With everything that has been happening to her, she still manages to put a smile on her face all day long and touches the hearts of those around her. She counsels patients in hospital without asking anything in return. 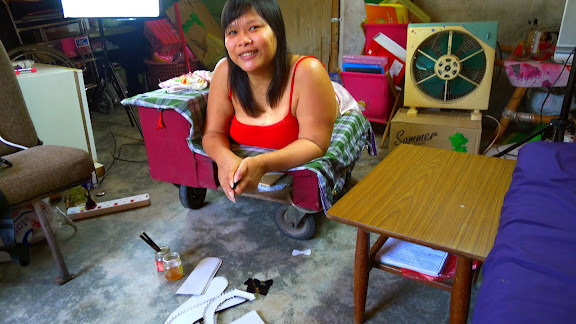 In Sept 2012, eHomemakers has managed to fundraise for her to go to Singapore to meet benefactors who donated a specially made wheelchair so that she can sit upright. This rehabilitation step is ultra important as she must be able to sit upright at all time before the much delayed and much needed surgery to reconstruct the urinary tract can be performed. From now on, she must have regular physiotherapy to strengthen her arms and back muscle to sit up, and also to transfer herself from the bed to the wheelchair by herself. Her rehabilitation in the next twelve months will be a great story to inspire others to persevere. This 20 minute TV quality documentary will track her rehabilitation journey for six months after the funds are raised. We will use it to fundraise for her house building, a van to transport her in the special wheelchair and medical expenses related to surgeries and rehabilitation. It will be called: Portraits of Perseverance – Undying Flame. A copy of the DVD plus acknowledgement as a minor sponsor in the documentary.